Trumbly Tattoo Removal is a professional, full service clinic specializing in modern removal of tattoos. 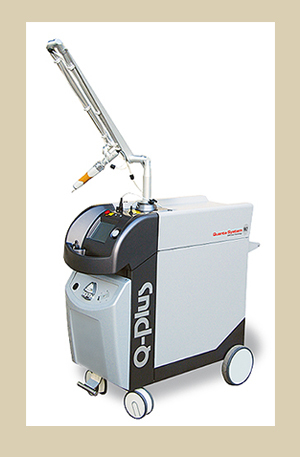 We utilize the latest technology: the state of art Quanta Q Switch Laser and the Zimmer Chilling System. 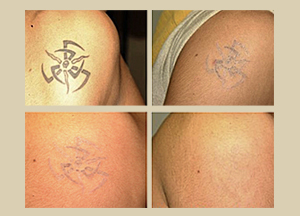 Laser tattoo removal is the safest and most efficient way to remove unwanted tattoos. Our FDA approved Quanta Q-Plus C is the only laser on the market that uses three true laser wavelengths specifically designed to target individual color pigments. Laser tattoo removal works by concentrating short pulses of laser wave lengths harmlessly through the top layers of skin onto certain areas of the tattoo. These wave lengths are selectively absorbed by the tattoo pigment which fragments into smaller particles that are easily removed by the body’s natural immune system. Our Zimmer cooling system is specifically designed to offset discomfort from the laser by numbing the skin prior to each treatment. The wavelengths are gently passed through the top layers of skin and absorbed by the tattoo pigment, leaving the lower layers of skin unaffected and unharmed. • We are one of the few tattoo removal facilities with the capability to remove all colors of ink. • The neck has great blood flow, which means you’ll experience minimal treatments for successful tattoo removal. • Homemade tattoos make for fast, easy removal with one to three sessions being the norm. Call us today for a free consultation and start reversing the past!